All images via Pinterest (my Fall Seasonal Fun board). This weekend I am making it a priority to indulge in lots of Halloweenish activities since Thanksgiving is right around the corner. There will definitely be some pumpkin baking, themed nail painting, and scary movie watching (abc family usually hits all the favs). What will you guys be up to? I love that pumpkin! I am currently debating on whether or not to carve mine - but I think the paint and bedazzle option is going to win! I'm totally on board with your Halloweenish activity weekend, there will definitly be some candy eating and horror movie watching going on at my house! LOVE that rhinestone pumpkin! I pinned a while back too, haha. I'll definitely be partaking in some Halloween activities this weekend too! My weekend sounds similar to yours with pumpkin carving and fall baking! I love that glitzy pumpkin and I've made those twig caramel apples before, they were a total hit! Have a great weekend! Your weekend is going to be amazing! Those stuffed peppers are so cute, and I love the hot chocolate. I'm stealing some of these ideas. I found a recipe for healthy home made rolos and I'm making them for a party I'm going to this weekend -- are you dressing up??? I don't have too much going on this weekend. Homework, a halloween party, some football. I definitely plan on enjoying some fresh squeezed apple cider. The best! I don't think I have enough hours in the weekend for this - so I'm going to have to live vicariously though you! 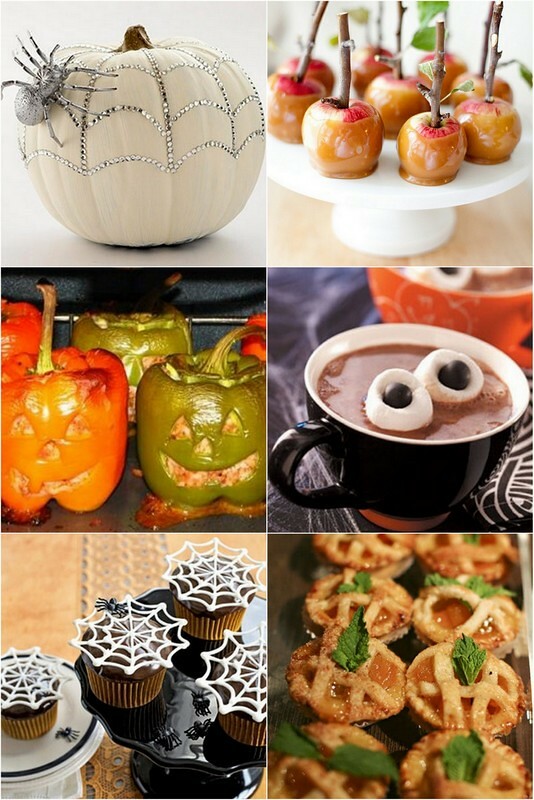 Love these ideas - so perfect for halloween.